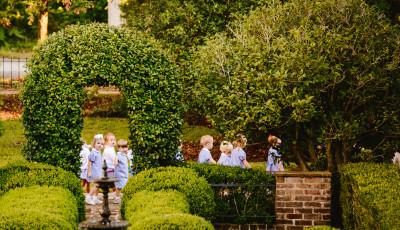 The vision of The Early Education Center at St. Paul’s Episcopal Church is to provide a program that nurtures the whole child: body, mind and spirit. Throughout our day we celebrate each child as a strong, curious, capable, unique creation of God. We strive to honor a spirit of inquiry and the joy of discovery inherent in all children.The EEC is a place of JOY where trust and respect are essential because we know that relationships are the foundation of learning. We recognize that the preschool years are a critical time to support a family’s transition to school, begin building relationships, and create a sense of belonging within our EEC community. Nurturing, supportive, warm, inviting environments provide an ideal setting for establishing a love of God, of people and of learning that will set a foundation of security and success for years to come. Our teachers, therapists and administrative staff members combine a deep love for our Tiny Saints with a devotion to age-appropriate instruction. Our passion is to offer a well-balanced variety of experiences, which stimulate creativity, instill a strong academic foundation and provide an opportunity for self-exploration. Children learn and play in classrooms that are spacious, bright and colorful and generously supplied with curricular material, age-appropriate toys and tools for creative learning. Music, Drama, Christian Education, Motor Movement and Art classes are taught by talented enrichment teachers and are held in dedicated classrooms that provide multisensory learning opportunities. Our Outdoor Classroom is a crucial part of our program because we believe (and child development research confirms) that in order to nurture the whole child we must acknowledge that children’s learning is constant and rooted in PLAY. The Outdoor Classroom provides children with opportunities to embrace their wonder of the natural world and to engage in experiences that are personally meaningful to them. We seek opportunities to encounter and explore nature together as children lead us with their curiosity and drive to explore and discover. 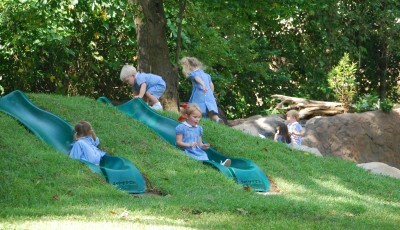 We hope you’ll visit soon and join us in embracing the curiosity and wisdom of childhood! We believe in embracing the whole student therefore, running, jumping, singing, dancing, praying, creating, collaborating and resting are a part of their everyday school routine. We strive to provide our young students with opportunities to enhance their fine and gross motor skills in their indoor and outdoor classrooms and through their special subjects. 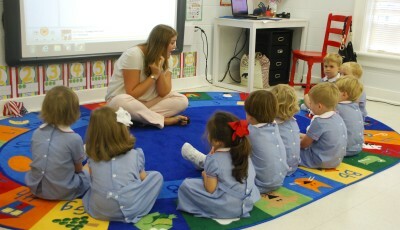 We seek to prepare young children for their future as students. Together with their teachers, students work toward meeting and surpassing benchmarks that are established based on their age and stage of development to ensure that they develop a love of learning and are well prepared for their future education. The benchmark system is used by St. Paul’s School and has been adapted to be developmentally appropriate for 2, 3 and 4 year old children. Through our daily chapel services and classroom activities we help students develop a knowledge of who we are as God’s children, who God is as our Creator and how His works are displayed within us and throughout our world.